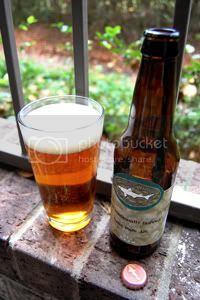 60 Minute IPA is Dogfish Head's flagship, and best-selling, beer. As it's name suggests, hops are added to the wort continuously for 60 minutes during the boil. When he set out to brew a proper India Pale Ale, founder Sam Calagione was unhappy with the results of the traditional method of adding bittering hops early in the boil and finishing hops at the very end. He decided that to get the balance he was striving for, he would have to continuously add hops during the entire boil. His first attempt at this was to rig a vibrating football game covered with hop pellets above the brewing kettle during the boil. While it worked for that one batch, it wouldn't last, so "Sir-Hops-Alot" (a more "industrial" version) was born, and is used to this day. Dogfish Head also brews 75 (available at their brewpub), 90 and 120 minute versions of IPA this way, obviously all with more exposure to hops. Another neat thing about this series of beers is that the number in the name corresponds not only to the amount of time hops are added to the boil, but the ABV and IBU (International Bittering Units), as well. So, 60 Minute is 6.0% ABV and measures in at 60 IBUs. According to Dogfish Head, the hops varieties that 60 Minute is exposed to consist of Warrior, Amarillo, and "Mystery Hop X." While it sounds like something out of Speed Racer, I'm sure it's something pretty cool if it comes from DFH. The brewery describes the beer as being as a "powerful East Coast I.P.A. with a lot of citrusy hop character" along with "cedar, pine & candied-orange flavors." 60 Minute used to be bottle-conditioned, meaning that there's a secondary fermentation and maturation in the bottle, but all references on both the label and website have been struck. I don't see any reason for the brewer to remove these references unless the beer is no longer bottle-conditioned, which is a real shame. Appearance: Crystal-clear amber body with a two-finger tall bubbly, white head that slowly fades into a quarter-inch blanket that leaves above average lacing. Aroma: The second I cracked the bottle open, my porch filled with the smell of hops. On closer inspection, the hops are citrusy (specifically grapefruit and orange peel), piney and ride on top of a caramel backbone. There's also a strange smell, reminiscent of Orange Lucozade in there somewhere. Taste: Hops are surely the showcase here, and they're bitter, citrusy, and piney. The sweet, biscuity malt character is very much in line with what the hops dish out, allowing for a near-perfect balance. It tastes like there's more alcohol than there really is for some reason. The aftertastes is biased towards the malt and booze, but the bitterness is still there. Mouthfeel: Medium-bodied and a little creamy with moderately-high carbonation. Drinkability: With the brewery describing this as "the session beer for beer geeks like us," it better go down the hatch easily. Even with the moderately-high 6% ABV, 60 Minute IPA is certainly the most sessionable offering from DFH head I've tried yet (of course, most of their beers are well over six percent...). The hops are intense, but not to any level that keeps you from ordering another. Verdict: When compared to the rest of the Dogfish Head stable, 60 Minute is certainly one of the least extreme offerings. But that's the point, DFH mean for 60 Minute IPA to be a balanced, very drinkable, yet still exciting and unique everyday beer. A terrific example of the American India Pale Ale style, and of beer in general. After this, I'm dying to try the four-pack of 90 Minute and single bottle of 120 Minute that await me in my "cellar." I may be a hops enthusiast, but the 120 is eons better for the money. The 60 is child's play.